Skewers a toothpick through shrimp from top to tail to prevent curling or keep prawn straight, blanch it hot water for 2 minutes take out when it turns into pink and immediately cool in running water. Remove the tooth pick, shell and back vain, Make a slit up the belly lengthwise and open cut. Mix wasabi powder with water to a paste of muddy (clay - like) consistency. Wet hand with in hand vinegar mixture, Take a handful (2-3 tablespoon) of cooked Vineyard Rice on one hand and mould into a rectangular cylinder shape of approximately 2 X 1 X 1 inch. 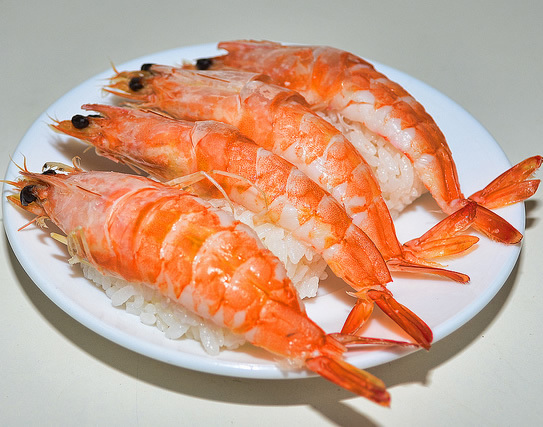 Put a little (tiny) bit of wasabi paste on top and cover with an open shrimp.